Carey Hofmann is a 30-year veteran of the security industry based in Phoenix, Az. UL/cUL Listed metal cabinets protect electrical and electronic equipment and provide a degree of protection against ingress of falling dirt. 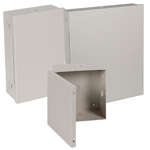 Ideal for junction and power supply boxes, the heavy-duty powder coated metal helps protect against corrosion, (for indoor use). Constructed with a continuous piano type hinge, optional key or thumb lock and seven conduit knockouts ½” or ¾”. Metal meets or exceeds Type 1 requirements. Six sizes. How important is a social networking strategy to your business? APA Montreal Roadshow 2014 March 20 Montreal, Que. Tyco Security Products Roadshow March 25 Toronto, Ont. Tyco Security Products Roadshow March 27 Laval, Que. Focus on Financial Security March 27 Richmond Hill, Ont. ISC West April 1-4 Las Vegas, Nev.
Security Canada East April 23 Laval, Que. BICSI Canadian Conference & Exhibition April 27-30 Vancouver, B.C. Security Canada Alberta May 8 Calgary, Alta. Anixter Showcase May 29 Montreal, Que. Security Canada Ottawa June 4 Ottawa, Ont. Focus on Retail Security June 19 Richmond Hill, Ont. Security Canada West June 25 Richmond, B.C.